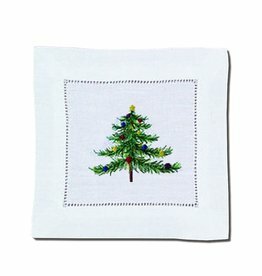 Embroidered Christmas Linen Cocktail Napkin-White. Size: 6 inch square. 55% Linen, 45% Cotton. Peking Handicraft Inc. Handcrafted quality handcrafted linens for the home, home fashions, holiday celebrations, entertaining and more.